They returned to Alabama in 1954 when the-not-yet-Dr. King accepted the pastorate at Dexter Ave. Baptist Church, a few blocks from the Capitol building in Montgomery. The Kings were still getting settled when the Montgomery bus boycott began in December 1955. Reddick doesn't re-tell that story, but he does describe some of the personalities involved, not all of whom have made into the history books. Dr. King was chosen to head the Montgomery Improvement Association, which ran the boycott, in part because he was a newbie and not a creature of any of the factions in the black community. Reddick does give us some intriguing details about the Montgomery movement, such as that Juliette Hampton Morgan (right), a white librarian, wrote a letter to the major morning newspaper comparing the bus boycott to Gandhi's marches. (He doesn't mention that she was ostracized by her white colleagues and family for her racial views, harassed and threatened. She committed suicide after a cross was burned on her lawn in 1957). Although King was traveling the path to Gandhian non-violence when this letter was written, he wasn't there yet, which is why he could apply for a permit to carry a pistol. Reddick tells us he was turned down, despite many threats on his life and family. Reddick gives King high marks for his oratorical skills, which made him a draw at mass meetings, and for his interpersonal skills, which made him a good chair at MIA meetings, but lesser ones as a negotiator with the city over the busses. Given that he was still a very young man who had spent most of his life going to school, King expected give-and-take to lead to compromise. He found obduracy. Each side expected the other to back down — completely. Neither happened. Even though King was the official President of the MIA, it was others who were quoted as the boycott leaders, especially local attorney Fred Gray, who challenged the segregation law in federal court. Only when King's house was bombed two months after the boycott began did his face begin to appear in the national press. His oratorical skills made him an attractive speaker at venues all over the country. 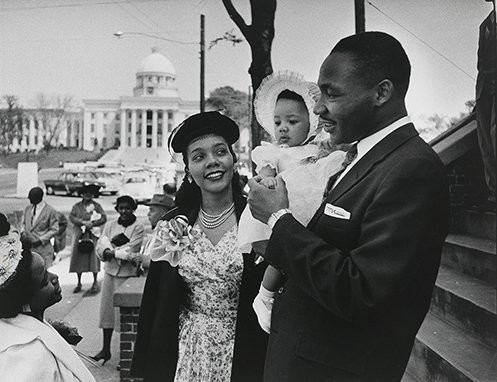 By the time a Supreme Court decision ended the boycott, King was a major public figure. Reddick (right) continues the story of King, Montgomery and the MIA until 1959, when this book was first published. His story contains some fascinating tidbits that I did not know, and I know quite a bit about Dr. King. People do look different close-up and near-term from what they will look like later or after they are dead. The Montgomery story didn't end with the boycott, and the Southern Christian Leadership Conference (SCLC) went on to do a lot more in Alabama and elsewhere. Most of what it did in the late 1950s has been obscured by the sit-ins that started in 1960. That year Dr. King moved to Atlanta, to rejoin his father's church as associate pastor while pursuing his real career as President of SCLC and a civil rights leader. Reddick was fired by Alabama State at the order of the Governor. He went on to teach at several other colleges and publish two more books. He was one of many supporters and activists in the Montgomery movement who had to leave town and/or had their lives and careers derailed. Changing the "Southern Way of Life" was not easy, and, 60 years after this book was first published, is still a work-in-progress. Jo's own "work in progress" is Tell It Like It Is: Living History in the Southern Civil Rights Movement, 1965-66.